Matthew Whitaker likely never imagined himself in this position-elevated from relative anonymity to temporarily lead the U.S. Justice Department, staring down newly empowered Democrats from the hot seat in a congressional hearing room and fielding questions about his fraught oversight of the special counsel's investigation into Russian interference in the 2016 election. Whitaker at one point took it upon himself to enforce the committee's time limits. When Nadler asked whether Whitaker had "ever been asked to approve any request or action to be taken by the special counsel," Whitaker's reply produced gasps and laughs inside the hearing room. "Mr. Chairman, I see your five minutes is up," he said. "I'm here voluntarily. I agreed to five-minute rounds." Whitaker, testifying at at oversight hearing, said he was looking forward to discussing "some of the accomplishments and priorities of the Department of Justice." After the opening questions, he said he was a "little surprised" that the discussion hadn't yet turned to the Justice Department's efforts on violent crime, the opioid crisis, religious liberty and free speech on college campuses. There should have been no surprise, of course. Weeks in advance of the hearing, House Democrats had sent Whitaker a list of questions concerning any conversations he had with President Donald Trump and White House officials about his leadership of the Justice Department. Democrats didn't want to hear Whitaker demur out of a desire to preserve the president's ability to claim that communications were shielded by executive privilege. The idea was to give Whitaker time to consult with the White House and arrive at the House Judiciary Committee prepared to clearly assert privilege or answer questions. Whitaker had earlier undergone what some media reports described as "significant prep" for Friday's hearing, where he testified that he hadn't interfered with the special counsel's investigation or shared information about it with the White House. 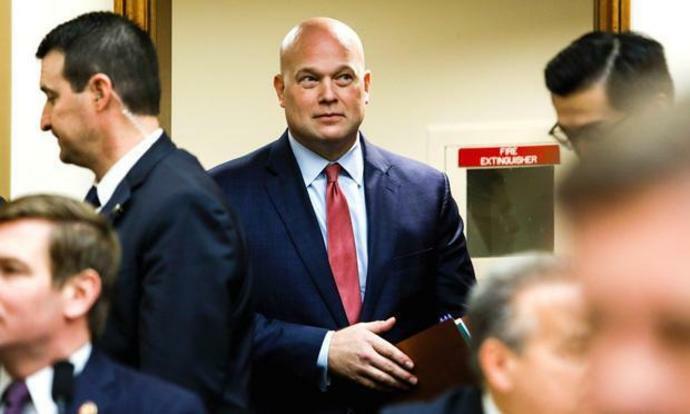 Whitaker was thrust into the national spotlight only months ago when then-U.S. Attorney General Jeff Sessions was forced out by President Donald Trump. Trump constantly-and very publicly-berated his attorney general, humiliating him on Twitter and in public remarks. Whitaker, a former U.S. attorney in Iowa, at the time had been serving as chief of staff to Sessions. It was not exactly a position that makes you accustomed to the spotlight. In the hearing room Friday, Whitaker gave halting responses at times, resisting "yes-or-no" questions before ultimately ceding an answer. U.S. Rep. Jerrold Nadler, D-New York, and the committee's chairman, would accuse him of "filibustering," stalling and wasting "members' time." Another Democrat, U.S. Rep. David Cicilline of Rhode Island, opened a round of questioning telling Whitaker there was no need to thank him for a question. Nadler, referencing a press conference in which Whitaker briefly addressed the special counsel's investigation, asked whether he'd been briefed on the probe. "Mr. Chairman, thank you for that question. As you know I cannot talk about ongoing investigations," Whitaker told Nadler. "You can say whether you've been briefed or not," Nadler replied. "As you commented about my recent press conference, as it relates to the special counsel's investigation, I have been briefed on it," Whitaker said. "So the answer's yes, thank you," Nadler sad. "Chairman, I know you're very interested in the special counsel's investigation, and so I want to be very clear about this. Because General Sessions was recused from the special counsel's investigation, I had no involvement in the special counsel's investigation," Whitaker responded. "So the answer's no. So the answer's no," Nadler said. "Thank you." Whitaker was more eager to answer questions, largely from Republicans, about efforts to combat violent crime and opioid use, along with the growing caseloads of immigration judges tasked with reviewing claims for asylum. Whitaker called attention to his and Sessions' efforts to expedite the adjudication of asylum claims. "Quite frankly, the number of immigration judges we have has been overwhelmed by the number of asylum seekers," Whitaker said. "Meanwhile most of these folks," he added, "are not part of the detained docket. They are part of the released docket. Those cases take longer-the ones that are not detained, the non-detained docket. And they have caused, since 2008, that number to go dramatically up." The top Republican on the committee, U.S. Rep. Doug Collins, R-Georgia, asked about the indictment and arrest of Roger Stone, with a focus on how CNN knew to stake out the longtime Republican political operative's Fort Lauderdale, Florida, home in time for his early-morning arrest. Whitaker said, "Tt was deeply concerning to me as to how CNN found out about that." Whitaker, appearing in a congressional hearing for the first time, would not offer a yes-or-no answer even on the question of whether he had been confirmed by the Senate. When U.S. Rep. Sheila Jackson Lee, D-Texas, asked that question, Whitaker answered not with a "no" but with an explanation that he'd been appointed acting attorney general under the Federal Vacancies Reform Act, a statute the Trump administration has invoked to temporarily fill several top government posts. Whitaker kept his eye on the clock during the hearing. Just before 1 p.m., as the committee took a five-minute recess, Whitaker could be heard asking, "We get five minutes for lunch?" in apparent disbelief. An unamused Jackson Lee shot back, "Mr. Attorney General, we're not joking here. And your humor is not acceptable." Nadler signaled that the House Judiciary Committee would seek in coming weeks to depose Whitaker. The public appearance before the committee Friday was likely Whitaker's last-at least as the leader of the Justice Department. The U.S. Senate this week advanced the nomination of Kirkland & Ellis counsel William Barr as the permanent attorney general.